“Take a horned toad, for example. If you think you’re better than a horned toad, you’ll never hear it’s voice – even if you sit there in the sun forever….Don’t be ashamed to learn from bugs or sand or anything.” From The Other Way to Listen by Byrd Baylor and Peter Parnall. This morning I am learning from my chickens, and I am not ashamed. Our very first chicken was a juvenile rescue from a friend – the sole survivor of a fatal attack on her flock by a roaming dog. We named her Rosie, and she badly needed a friend. We asked a farmer friend who we bought goat milk from if she might have an older hen that we could take as a companion for Rosie. She had many chickens and we thought it wouldn’t hurt to ask. 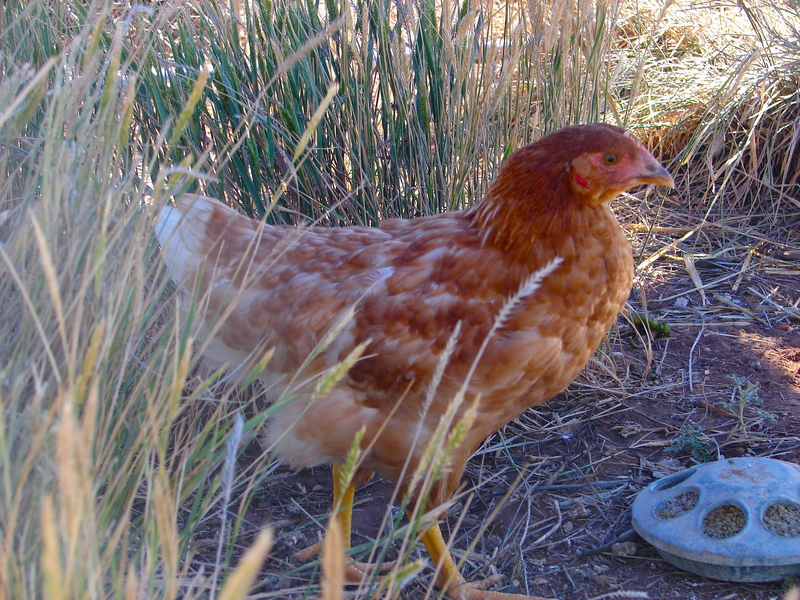 Roberta agreed to let us take one of her Rhode Island Reds, who we brought home, and named Gertie. 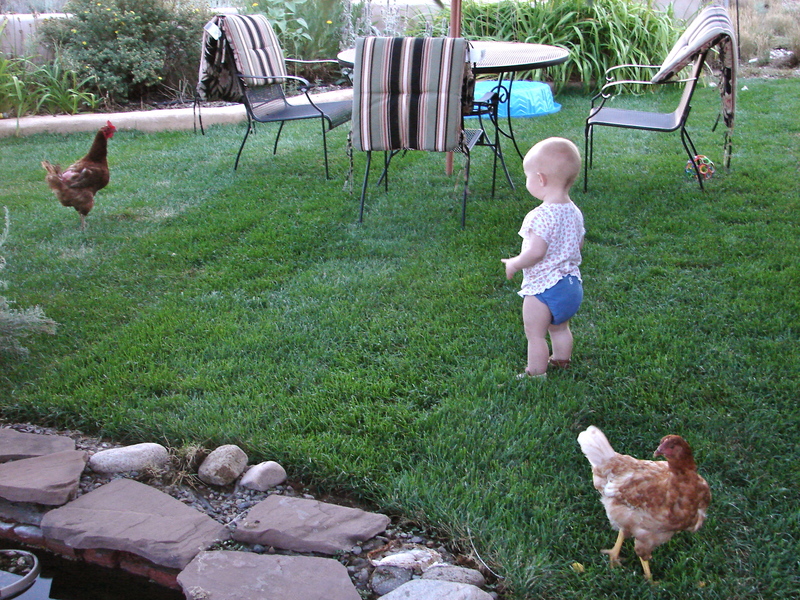 Summer of 2010: Young Rosie comes home with us to launch our newest farm project - Adventures With Chickens. At first I was alarmed by the lack of feathers on Gerties rump – a sunburned example of living at the bottom of the pecking order. She was in rough shape – visually at least. Later I understood the wisdom of removing her from her daily torment. 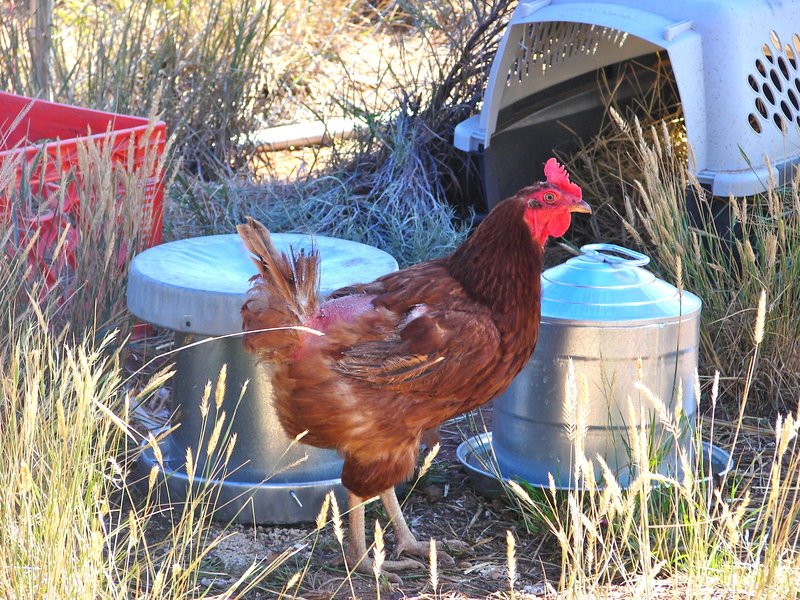 As the eldest in our flock of 2, she was suddenly the matriarch hen. Young Rosie followed her about like a good minion, taking the occasional abuse Gertie had learned from her previous flock and now carelessly doled out to her new devotee. Gertie, our second chicken, sports her sunburn with cranky pride. 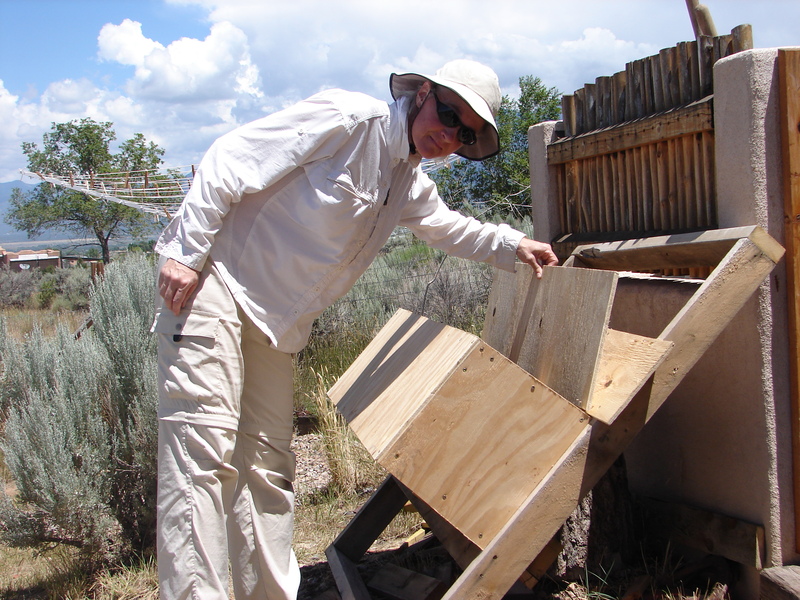 We raised mail order chicks separately that spring and finally, as the aspens turned golden on the mountain side, we introduced the 2 flocks into their new coop together. Gertie remained at the top of the pile. Although she recovered her feathers and became a handsome flock leader, she was never nice. She chased the other hens and pulled out their feathers, ruling her underlings with an iron beak. And honestly, although I understood the dynamic that had turned her mean, I have never liked her. Unlike Rosie, who followed me around the farm like a panting retriever, Gertie avoided me like I stank. There was never any opportunity to bond with her. She would not allow it. Settling into their new home, Rosie and Gertie explore the fresh sod with Isla (then 16 months old). Building the coop took a long, long, LONG time as Isla was only 16 months old and I was the sole available builder. "An egg! An egg!" 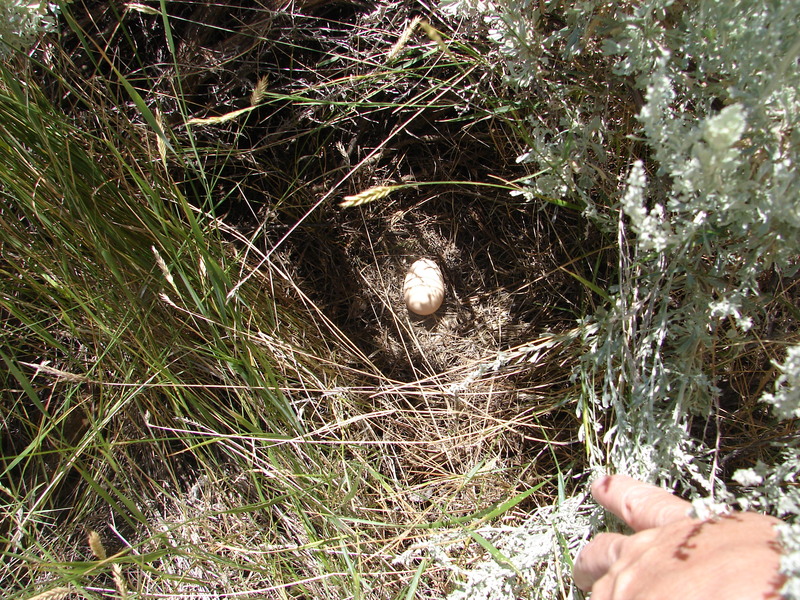 Gertie graces our farm with it's first ever egg! It was a great cause for celebration! The following summer she was showing her age. She was already 2 or 3 yrs old when we got her – over the hill in chicken years. Her second year with us, at 3 or 4 yrs old, she barely laid any eggs. We always knew her eggs as they were BIG, and she was our only RI Red. 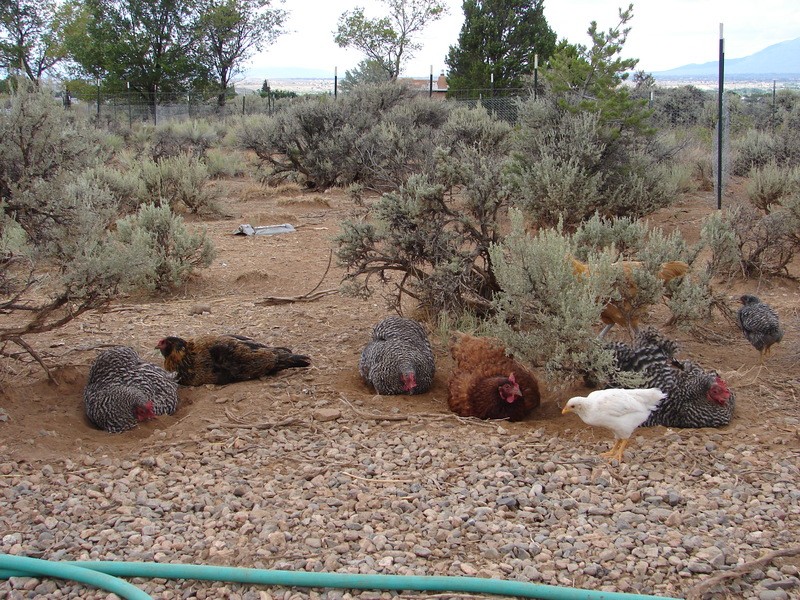 Late that summer, after a series of predator attacks on our flock that took 3 laying hens and 4 chicks, Gertie suddenly seemed…. injured? It was hard to tell. She waddled about awkwardly, like a penguin instead of a chicken, way too upright, resting her bottom on the ground instead of her belly. She seemed off balance. She listed to starboard. But she still made it up the ramp into the coop each night. I could not get close enough to her to examine her for issues but assumed she may have been hurt in a tousle with an attacker. I thought each day would be her last as she progressively got worse and worse (yet still remaining able to allude capture). 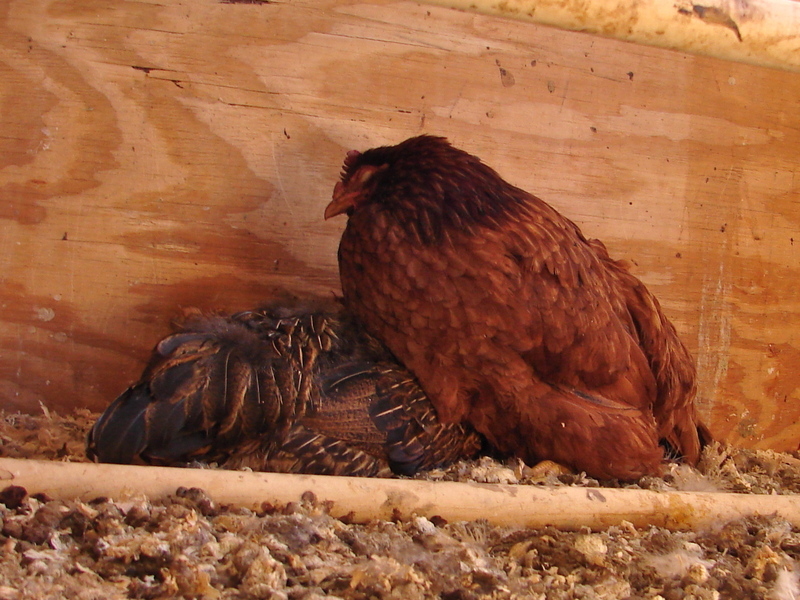 Then one day, instead of finding her dead in the coop, I found her… completely normal. It is still a mystery. Gertie, lording over her flock. She's the massive bird in the center. And here we are, another year later. Gertie has really been showing her advanced age of 4 or 5 yrs. She spends a lot of time in the coop, even during the day. She has been drifting in and out of progressive decline for a few weeks. This morning, when I went to wash the water tube, I peeked in the nesting box for morning eggs and saw instead Gertie and Dot, huddled together face to face on the coop floor. Dot, my favorite of our 3 Americanans, was gently and lovingly preening Gertie’s neck and face. Gertie’s inner eye membrane was closed over her eye, giving it a milky, blind appearance. She was drooping heavily against Dot. Tears sprung unbidden into my own eyes. I was not so much sad for Gertie’s emminent passing – I would not particularly miss her. But Dot’s devoted support of her cranky flock matriarch was more than I could stand. As I watch, Gertie began to droop more and more against Dot, her head hanging lower and lower off towards Dot’s head. Dot carefully shuffled under Gertie’s slumping form, supporting her with her own body as best she could. Dot has pushed herself under Gertie's side to help support her drooping frame. And there the two have remained, in that same position, all morning…. waiting. It is hard not to anthropomorphize this touching scene. Do chickens love? I do not know. Do they respect authority? Perhaps. I do remember seeing Dot hanging with Gertie at times, the 2 of them nesting side by side under a favorite sage brush or in the corner of the winter garden. But I have never noticed the apparent devotion I am now witnessing. I wonder if Dot will mourn her passing. Dot was a mail order chick with no mother hen that she had ever known or seen. I doubt Gertie was ever particularly nice to her, and certainly never motherly. Yet here they lay, Dot attending the death watch of her flock leader, patiently, tenderly, waiting and supporting as the current rule succumbs to the inevitable cycle of life and death that none of us can escape. This was very interesting & oh so tender MacLaren! Thanks Papa Jim and Gigi. It has been a thoughtful morning….. heading out to bottle feed Bucky now and we’ll check on Gertie at the same time. On the last check, Dot had hopped into a nesting box to lay and egg and Bobo had taken over the death watch. So very, very curious to witness this process. I wrote about losing animals today as well after losing a chicken, a quail and two kittens this weekend. I’m always at least a little sad even if it’s not one I’m emotionally attached to. Hope you feel better soon! I know I am supposed to be tough in order to manage a little farm, but I will always be the softie I’m afraid. Loss of life is hard, any way you stack it. A good farmer should care about their land and their animals. So getting emotional about even an old ornery hen is a good sign! I am enjoying your blog and its parallels to my own discoverys and experiences, even though mine are under rather different circumstances and locations. My little flock has taught me a number of lessons, and when our matriarch, Lucy, passed away (at 12 years old! ), I felt like I was loosing a sister. I hope the lesson becomes clear, and that you realize that it is perfectly normal to mourn the passing of any life. SO glad to know you are reading my blog TC! I hope we can some day come up to visit you 2 in the great white north and take a dog sled trip! It’s always been my dream….